Over the past decade, renewables-based technology and sustainability assessment methods have grown tremendously. Renewable energy and products have a significant role in the market today, and the same time sustainability assessment methods have advanced, with a growing standardization of environmental sustainability metrics and consideration of social issues as part of the assessment. 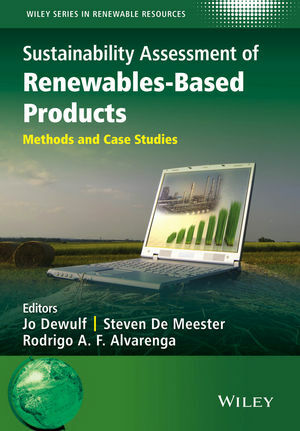 Sustainability Assessment of Renewables-Based Products: Methods and Case Studies is an extensive update and sequel to the 2006 title Renewables-Based Technology: Sustainability Assessment. It discusses the impressive evolution and role renewables have taken in our modern society, highlighting the importance of sustainability principles in the design phase of renewable-based technologies, and presenting a wide range of sustainability assessment methods suitable for renewables-based technologies, together with case studies to demonstrate their applications. This book is a valuable resource for academics, businesses and policy makers who are active in contributing to more sustainable production and consumption. Case studies: renewable energy, bio-based chemicals and bio-based materials. Professor Dewulf performs research in the areas of environmental chemistry, environmental technology and clean technology at Ghent University. Since December 2013, he has been working as a senior researcher in the Institute for Environment and Sustainability at the Joint Research Institute of the European Commission. Key in his work is managing natural resources in a technically efficient way, performing thermodynamics based sustainability analysis at process, plant and cradle-to-gate level to support the development and assessment of new technologies. Dr De Meester works on the development of sustainability assessment methodologies for new technologies and applications of Life Cycle Assessment in industry.